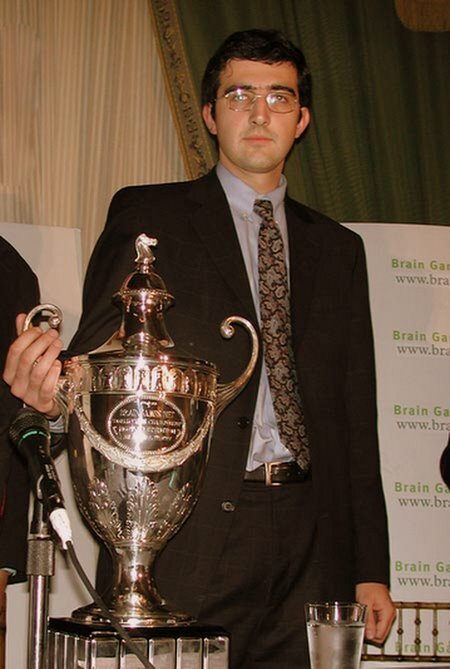 His name is Vladimir Kramnik. And he deserved every bit of it. In my opinion, Veselin Topalov (his opponent) used shameless off-the-board tactics to try to disrupt Kramnik’s momentum. The story is that Topalov complained, after game 4 (the match was 12 games), that Kramnik was using the bathroom too much (Kramnik has a medical condition), and also accused Kramnik of cheating while in the bathroom. Their proposed solution was to hav one bathroom. The problem with this was that the protest was lodged way too long after the fourth game to be a legitimate protest. But the FIDE committee approved the change anyway. Kramnik refused to play game 5 because of this breach of terms. As a result, the FIDE committee ruled game 5 a forfeit in favor of Topalov. The president of FIDE used diplomacy to get the players to continue the match (Kramnik agreed, but only with the proviso that he would still be able to context the status of game 5). The twelve games ended in a tie 6-6. The rules then provided for four rapid games. Kramnik won the tiebreaker 2.5-1.5. So Topalov’s pathetic strategy did not help his image in the slightest. Furthermore, he lost the match anyway. I am quite relieved, in a way. I believe that Kramnik is the better player (Kramnik took the classical world chess championship from Kasparov). Furthermore, there is no question in anyone’s mind now who the world chess champion is. If Topalov had won the rapid games, then there would be a shadow over the championship. You can read plenty more of everything, including commentary on all 12 games, over on Susan Polgar’s chess blog, here. It is possible to make an idol out of just about anything that is good in this life. John Calvin once said that our hearts are “idol factories.” We tend to want to take God off His throne, and put just about anything else in its place, from wealth, happiness, and health up to and usually including ourselves. Even Christians are not exempt from doing this sort of thing. There is an idol in our community that I wish to attack. It is consuming us in many ways, though not an evil thing by itself. Few idols are bad things in and of themselves. Who would say that health, wealth, and happiness are bad things in and of themselves? However, the moment we start to depend on it for what we want out of life, it becomes an idol. This idol is crowding out many other worthy things that we could do with our lives. This idol is taking up too much of our time and resources. I am talking about sports. There is a great pressure especially for high school students to engage in these sports. If all the students do not participate in all the sports, then the program often simply cannot work at all. There are often few options for a sports team if it wishes to compete at all. This is understandable. However, sports can then participate in the fever that often grips small communities, the fever that if we do not do something, we will lose our community entirely. This is similar to people who are drowning. They panic, and if the person trying to rescue the drowning person is not careful, then the rescuer will drown too, because the drowning person will clutch at them in a panic, and down they both will go. Am I against sports? No. It is not a bad thing in and of itself. However, what is more important, church or sports? Music or sports? We have had one Linton student go on to professional sports. Count them, one. How many of our high-school students will go on to professional sports? I think if we were honest with ourselves, we would have to admit that very few do. It is simply a fun thing that high-school students do for a while. But high-cultural things surely are more important, are they not? Music can be done all one’s life. And yet where is music on the radar screen? We are having difficulty merely getting people to come out for the Christmas program. This should not be. And we cannot schedule anything for any day other than Sunday, because there are sports events constantly. Church events are carefully circumscribed within a very small boundary. Wednesday night is possible (sometimes) for church events, and Sunday is possible for church (though many abuse the fourth commandment in this regard). There is no other time in which any church event can be held, except for holidays. Is this merely the frustrated ravings of a musical pastor snob? I hope not. Philippians 4:8 says this: “Finally, brothers, whatever is true, whatever is honorable, whatever is just, whatever is pure, whatever is lovely, whatever is commendable, if there is any excellence, if there is anything worthy of praise, thing about these things.” Presumably this would imply that the better things are worth thinking about more of the time. Are our priorities wrong? Of course, it is possible to make an idol out of culture. Again, we can make an idol out of anything. At the moment, however, I do not see that as a danger in our community. If someone were to say that to me, I would chalk it up to a knee-jerk reaction to having their own idol attacked. We are to worship God only, and serve Him only. Maybe we should shorten the sports seasons. Maybe we shouldn’t have sports year round. Are sports taking up so much of our time, that we cannot spend our time on what could really save our communities from extinction, namely, church events, and higher culture (which are a much more solid basis for a community)? Sports (especially high-school sports) does not draw companies to areas, and it does not prevent cultural stagnation. Let me stress one more time that I do not think sports are inherently evil. But I do think we have made an idol out of them. Let us reconsider.